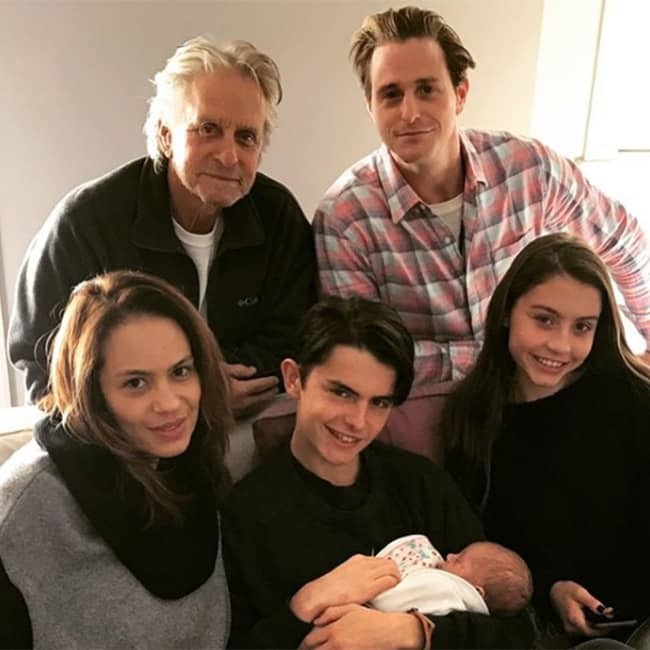 Michael Douglas' eldest son Cameron shared a sweet first family photo with his newborn Lua Izzy. In the picture, Cameron contently poses with his dad Michael, partner Viviane Thibes, and half-siblings Carys and Dylan, who is holding the baby. Along with the beautiful photo, the proud dad wrote: "What it's all about. #Blessed with #family." Michael also shared the picture on his official Facebook page, writing: "Enjoying a wonderful Sunday afternoon with my new granddaughter Lua, new dad Cameron, mum Viviane, Uncle Dylan, and Aunt Carys!" The 73-year-old Oscar-winning actor had previously shared a picture of little Lua when she was first born back in December, writing: "Congratulations to my son, Cameron, and lovely Viviane, on the birth of their daughter Lua!" Cameron had shared a throwback photo of Viviane with a baby bump to announce the exciting news, saying: "Today my appreciation for Mother’s all over the world has reached new heights... today I took part in a miracle as my baby girl was introduced to the world through a beautiful Amazon warrior... I'm so proud of you @vivianethibes. #iloveyou." The musician opened up about becoming a new dad to Entertainment Tonight: "I'm really looking forward to it, and I think it's going to be more inspiration and drive to really try to put a nice life together for my daughter." Cameron's daughter is a new beginning for him, as she was born merely 16 months after he was released from prison. He was sentenced to nearly seven years on drug convictions, two of which were spent in solitary confinement. Michael has previously discussed Cameron's conviction in an interview with Megyn Kelly. "My oldest son Cameron has struggled with addiction for most of his life," he said at the time. "He was a serious heroin addict, that brought him into federal prison. It broke my heart, the combination. When he was sentenced, I knew the amount of time he was going to be spending in federal prison combined with my early cancer at the same time."